I love the pic but hate the colour of that frame Terri. It does nothing for a great image. Try a 20 pixel black outline then 1 inch white frame. I tried framing it black and then white...nothing seemed right. I'll try your suggestion tonight. Thank you kind sir. I was working on the b/w frame that Stewart suggested...just got side tracked. 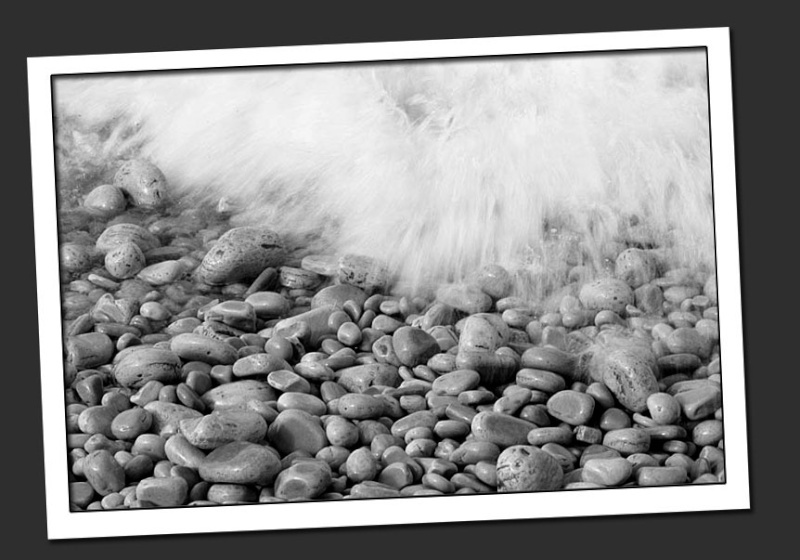 I think I prefer the pic in color...although, there are some nice designs in the rocks the come out on the b/w. Wow...am I wishy-washy today! I am with everyone else on this one. I love the photo not big on the frame. But then again I am not big on frames unless it is hanging on my wall. But the frame Stuart did with the coloured version looks good. I think the brown frame in the original takes your eye away from the photo whereas the bw frame gives it depth. Ok...So, were all in agreement...the brown frome must go!! I will change it this aft. Although, I'm not fond of the color in Stuart's...this is a famous beach...one of only two in the world...it's a white stone beach. They actually have signs up saying that you cannot take the rocks or there is a fine...well, you know me, don't tell me I can't do something!!! I like the colour of the original posted image too.